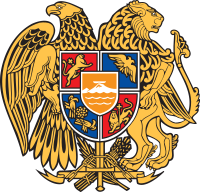 The naitional coat o airms o Armenie (Armenian:Հայաստանի Զինանշան) consists o an eagle an a lion supportin a shield. The coat o airms combines new an auld seembols. The eagle an lion are auncient Armenian seembols datin frae the first Armenian kinricks that existit prior tae Jesus Christ. The current coat o airms wis adoptit on Aprile 19, 1992, bi the Armenian Supreme Cooncil decision. On Juin 15, 2006, the law on the state coat o airms o Armenie wis passed bi the Armenian Parliament. The shield itself consists o mony components. In the centre is a depiction o Munt Ararat wi Noah's Ark sittin atop it. Accordin taeo tradeetion, the ark is said tae hae finally restit on the muntain efter the great fluid. Ararat is considered the naitional seembol o Armeni an sicweys is o principal importance tae the coat o airms. Surroondin Munt Ararat are seembols o auld Armenian dynasties. In the lawer left portion o the shield, thare are twa eagles leukin at each ither, seembolisin the lenth o the Armenian territory durin the reign o the Artaxiad Dynasty that ruled in the 1st century BC. In the upper left portion, thare is a lion wi a cross, the emblem for the Bagratuni dynasty that ruled durin the Middle Ages, atween 7t an 11t centuries. Unner this dynasty, Armenie blossomed culturally, makin its caipital, Ani, ane o the maist important cultural, social an commercial centers o its time. Bagratuni wis destroyed bi the Byzantine Empire's encroachment an bi Seljuk conquests in the 11t century. In the upper richt portion, thare is a twa-heidit eagle, the emblem o the first dynasty tae reign ower a Christian Armenie, the Arsacid Dynasty o Armenie. Tiridates III o Arsacid Dynasty made Armenie the first Christian naition in 301. This dynasty ruled frae the 1st century tae 428. In the lawer richt portion, thare is a lion wi a cross, the emblem o the Rubenid dynasty. This dynasty reigned in Armenian Kinrick o Cilicie, a state that expandit an prospered durin the 12t an 13t centuries, till the Mamelukes an Turks eventually conquered it. The eagle supports the shield on the left side o the coat o airms, while the lion on the richt side. The eagle wis the seembol o the Artaxiad Dynasty an later on the seembol o the Arsacid Dynasty o Armenie. It haulds the Artaxiad Dynasty's branch o the shield. Whereas, the lion wis the seembol o the Bagratuni Dynasty an later on the seembol o the Rubenid Dynasty. It haulds the Rubenid Dynasty's branch o the shield. Baith o thir ainimals wur chosen acause o thair pouer, courage, patience, wisdom, an nobility in the ainimal kinrick. The swuird represents the pouer an strength o the naition, breakin the chains o oppression. The broken chain represents effort shawn bi the naition tae gain freedom an unthridom. The wheat lugs represent the haurd wirkin naitur o the Armenian fowk. The feather represents the intellectual an cultural heritage o the Armenian fowk. The ribbon represents the colors o the banner o Armenie. The coat o airms o Transcaucasian SFSR 1922 - 1936. The coat o airms o Soviet Armenie 1936 - 1991. The present-day Armenian coat o airms haes its oreegins wi the establishment o the Democratic Republic o Armenie (DRA) in 1918. In that year, an early variation the coat of airms wis adoptit bi the DRA. The seembols on this earlier version wur placed in a slichtly different order an the eagle an lion hae thair tongues oot, givin them a mair menacin leuk. It's an aa worthy tae note that ae Munt Ararat (alang wi Little Ararat) are depictit while Noah's Ark is absent. The coat o airms wis designed bi architect an member o the Roushie Academy o Fine Airts Alexander Tamanian (best kent for his wirk on Yerevan's ceety plan) an airtist Hakob Kojoyan. In 1922, Armenie wis incorporatit intae Transcaucasian SFSR wi Georgie an Azerbaijan. The coat o airms o the Transcaucasian SFSR wis adoptit bi the govrenment o the Transcaucasian SFSR. It is uncertain when exactly it wis adoptit. It incorporates designs frae each o the three major groups that combined in the Transcaucasian SFSR, the Armenians, Azeri an Georgians, an unuisually features Islamic airt an communist elements side bi side. The latticewirk in the starn itsel bespeaks the umwhile coat o airms o Georgie frae 1918–1921 an adoptit again frae 1991–2004; the crescent moon represents the Muslim Azeris, on a backgrund depictin the naitional seembol o the Armenians, Munt Ararat. In 1937, a new coat o airms wis adoptit. Lik the DRA coat o airms, this coat prominently featurt Munt Ararat alang wi the Soviet hammer an sickle an red starn ahint it. The inclusion o Ararat brought objections frae Turkey acause the muntain is pairt o its territory. The Kremlin retortit that awtho the Turkish seembol wis the crescent, surely it did no mean that thay laid claim tae the moon. The Soviet Union brak apairt in 1991 an Armenie sicweys became an independent republic. In 1992, a slichtly modified version o the DRA's coat o airms wis adoptit an haes remained in place iver syne. Wikimedia Commons haes media relatit tae Coats of arms of Armenia. This page wis last eeditit on 31 Mey 2018, at 02:47.